The Last Refuge? – Forest & Bird The Last Refuge? Wanted: Hoon-free beach wanted for critically endangered bird (no = 36) to live in peace. Must be free of cats, dogs, 4WDs and hooligans. The longer you work in conservation, the more you realise the fickle nature of our moral judgements. One such species that has drawn the proverbial short-straw is the New Zealand fairy tern. All 36 individuals may shuffle off this mortal coil in the next few years – and not many people would blink an eyelid save for a few birders. And although it can claim the unenviable title of New Zealand’s most endangered bird, it looks like it will never be molly-coddled back from the brink like the kakapo. In fact, 4WDs sometimes mow them down. Hoons at the wheel of ‘Remuera tractors’ frequently speed past the warning signs and set themselves on a collision course with nesting terns. So why don’t they receive the same VIB treatment lavished on our kakakpo or kiwi? To determine where to allocate their budget cash-strapped DOC perform calculations to determine which species to prioritise. This priority ranking assesses certain factors: namely: the probability of success, the funds required, whether conserving the species would also benefit other species and the relative ‘value’ to New Zealand (or endemism). Unfortunately, the Fairy Tern scores poorly on the last value. 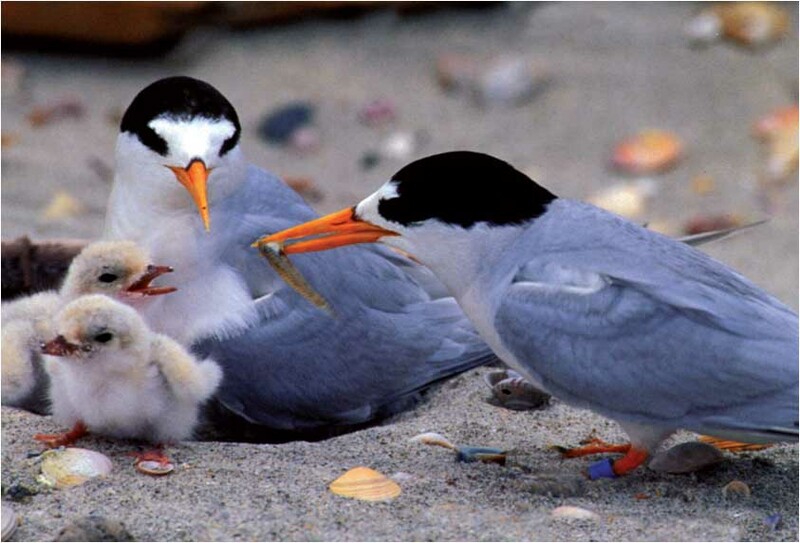 It’s specialness is diluted by the fact that they share a bunch of genes with terns in New Caledonia and Australia. And although the fairy tern population has hobbled back from a mere 15 individuals, it is still facing a rather uncertain future given its less-than-abundant gene pool. Of course, this has not been helped by its poor choice to stage its last stand. Indeed, its last refuge is next to a wilderness white-sand beach in Te Arai so prized by developers that its future has been thrashed out in court over the past 6 years. This area is so coveted by developers they’ve spent hundreds of thousands of dollars fighting court battles to develop a subdivision that would have housed 400 people. They’ve abandoned their latest plan in the High Court, but there’s nothing stopping these developers from trying again. The sad fact is that a lot of the money that could have been used in fairy tern recovery has instead being squandered in legal bills. Cognisant of the fact that the land surrounding this beach is privately owned and will always sought-after by developers, we have begun searching for new sites for fairy terns to live. Given that we’ll want to re-locate a fair number of birds – at least 10, or 30% of the population – we’re dealing with a high-risk situation. So ensuring they’re re-homed in a swift and safe manner is essential. To do this it helps to study them at close-range – already we know a lot about their parenting habits (they’re mollycoddlers), however this can’t be said about their feeding habits. One such study is looking closely at their blue pantry – estuaries – to figure out whether they divide it up into sections, or if it’s a free-for-all. That soon will be revealed, and then we’ll be a little closer to qualifying as their relocation agents! However at the top of the ‘to-do-list’ is convincing beach-goers that some areas are off-limits between the months of November to February – this is the only way we can really give these little fellas a fighting chance. Mark Bellingham. has contributed 7 entries to our website, so far. View entries by Mark Bellingham.. I hope you can find a new home for our fairy terns!!! Thier homeland seems like it’ll always face overcrowding – most northland beaches do though. I wonder if they’d be better off coming down south to one of our more secluded beaches??? ?